Anthony Breslin has been a powerfully original force within the Australian art scene ever since the late 90’s. During the past 15 years, Breslin has created more than 50 solo exhibitions both nationally and internationally, these include shows in Hong Kong, Zurich, Prague, Barcelona, Shanghai, Bern, London and Dublin. Breslin has also attained great success as a unique theatrical performance and installation artist, creating an abundance of performances and presentations at a diverse range of events and venues. Anthony performed at the Melbourne Convention Centre for the closing ceremony of the Parliament of World Religions, as well as performing at the ‘Signature of M’ art prize gala night at the Central Pier Venue in Docklands, Melbourne and the Conscientia Festival in Salt Lake City, United States. Breslin has also produced and performed in his own productions at New Quay, Docklands, Greenwood Gallery, Wax Studios and Theatreworks, along with a unique project in the Myer windows, Bourke St Melbourne and a variety of festivals and concerts including an Australia Day concert at Federation Square. Breslin’s groundbreaking production ‘Trybe: An opera in paint’ has been performed over three seasons in ever evolving incarnations to much public acclaim since 2006. The present version was performed in a two-week season in 2013 at the main theater at Chapel off Chapel, in Melbourne. 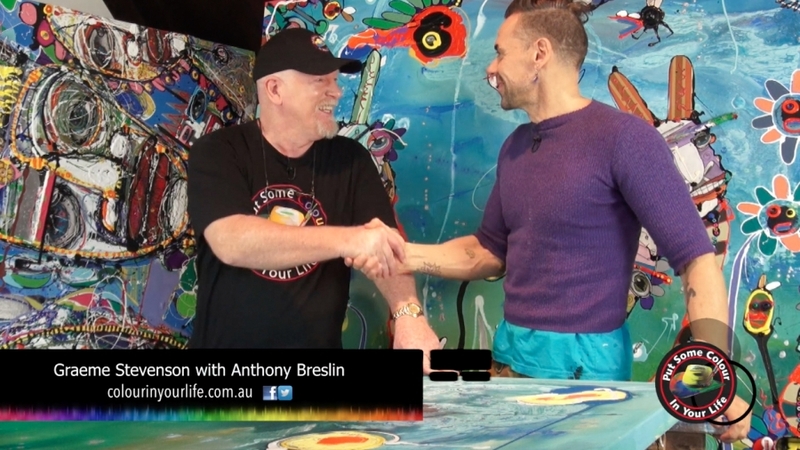 Breslin has produced and delivered many large scale community and charity projects, and has painted with celebrities for fundraising outcomes such as the unique Myer windows project. He is passionate about working with various community, marginalized groups and schools to build awareness and focus on the importance of community, belonging, and rites of passage.